Various Arduino projects that need to switch a high DC load are using MOSFET’s to do this, according to the circuit at the right (R1 is optional and may be necessary to switch off the FET if the pin goes low. Looking at those graphs one can see that at a gate to source level of 5V (Arduino levels) the IRF510 is only capable of delivering 1 Amp, whereas it is specified for 5,6 Amps continuous current. The 520 is somewhat better: at 5 V it delivers 3 Amps from its max of 9.2. This is because these FET’s are designed to pass the max current at gate voltages of around 10 Volts and that is beyond what most microcontrollers can deliver. For the IRF522 it is even worse. Looking at the curve, at a gate to source voltage of 5V the IRF522 is hardly turned on. You are limited to a current of about 200mA. Much better to use a cheap Darlington transistor then. At 5V volt on the gate, the IRF530 will pass something around 4.5Amps. If you are shopping for a MOSFET for the Arduino consider the IRL540 The L shows that is a logic level mosfet. A logic level mosfet means that it is designed to turn on fully from the logic level of a microprocessor. The standard mosfet (IRF series etc) is designed to run from 10V. 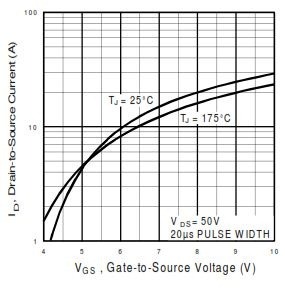 Now at 5V you are out of the linear region and the MOSFET can already deliver its specified 28 Amps continuous current. You may also consider the IRLZ44. The IRLZ44 data-sheet says that with a 3V TTL-level drive the FET drops less than 0.15V at 4A (at 25C, Rds(on) is about 0.04 ohms), and under 0.25V at 175C (Rds(on) < 0.063 ohms). So we know the FET’s I^2-R ohmic dissipation will be under 1 watt, and that’s good. 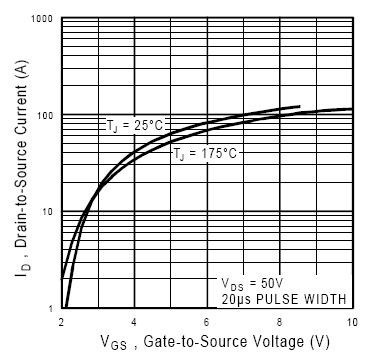 If we use Vgs = 4V, specified for AVR chip outputs, the dissipation should be about 0.4W at 25C (0.8W for Tj = 175C). Wether a MOSFET is a standard MOSFET or a ‘logic’FET becomes clear from the Datasheet. If for instance you look at the Datasheet of the IRFZ44N at the Rds(on), This lists the ‘on-resistance’ under the condition that Vgs=10V (and Id=25A). If there is no rating for Rds(on) when Vgs=5V (or 4.5V), then it is not a logic-level MOSFET. 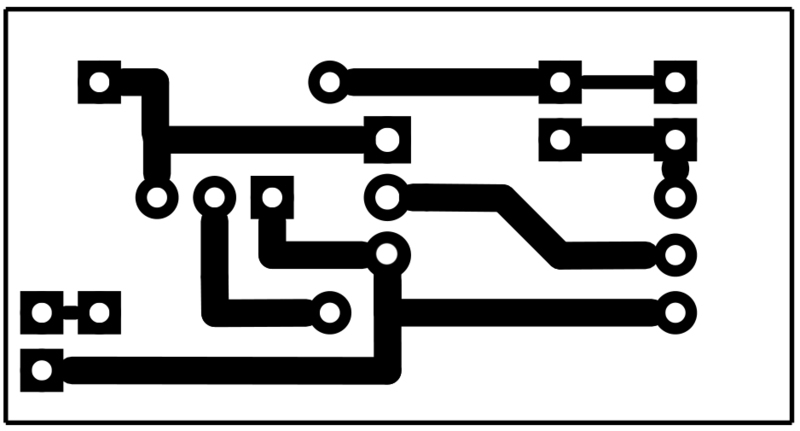 A logic level MOSFET will have Rds(on) specified for Vgs=5V or 4.5V. If its only specified for Vgs=10V, its not logic-level. Another thing to beware of in datasheets is Vthresh (threshhold voltage). 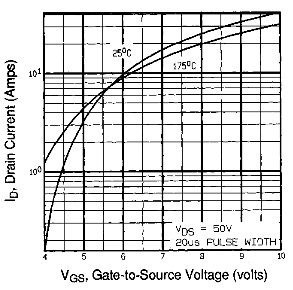 This is not the gate voltage to turn the device on, its the gate voltage at which it switches fully off (less than a few uA of current, typically). If Vthresh is given as 2..4V range, it cannot be a logic level MOSFET (Vthresh is usually 0.5 to 1V for logic-level MOSFETs). The dissipation then is 5x5x0.1=2.5 Watt. But suppose the FET you choose has 0.05ohm Vds(on) and carries 10A then it will dissipate I^2R watts, ie 10x10x0.05 = 5W. This will need a good heatsink if the load is on for more than a second or two, but it is no issue if it gets millisecond pulses every few seconds. ‘ON-resistance’ of 0.2 to 0.001 ohms are available (though less than 0.005ohms gets expensive). Realise though that it is an inverting circuit. A HIGH on the Output of the Arduino will switch the Load Off. Also the 520 and 510 will be more efficient with this circuit. If you are using this circuit to switch any serious loads, then it is wise to solder some thick wire over the tracks coming from the MOSFET. You will find the print design here. This is for direct transfer so it is already mirrorred the right way. For a long time ‘TTL” meant 5 volt. Nowadays more and more 3.3 Volt boards are available as well in the Arduino series as in the popular ESP8266 and the raspberry Pi. On these boards the STN4NF03L can be a good choice. Not an ideal choice, but a good one. Check section 2.1 figure 4 in the datasheet. Rob, the 10 k resistor is there to pull the gate of the FET to a high enough level to fully open up the FET. If it is not there, the gate will not get any voltage from the 12 V power source. What is T2? Product No? Thank you for the clear explanation. Is it possible to use two (or maybe three) IRF510 to handle more amperage? It would probably be best to just buy a FET that could handle the higher amperage, however I have some IRF510 s in my parts bin. Excellent post, was very illuminating! 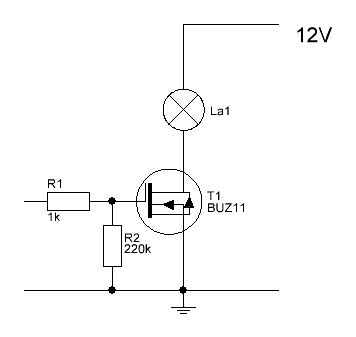 In the schematic where you show the BUZ11 FET, are R1 and R2 functioning as a voltage divider? Though technically it is a voltage divider, that is not really the function of it. R1 is just there to limit the current through the gat, coming from a microcontroller pin. Thanks a lot for this excellent article. I finally understood why the bipolar was added before the MOSFET! Thanks 4 the wonderful explanation. May the R2 to Arduino OUT be 220ohm instead of 1K? the LM324 is a quad opamp. driving a mosfet with it is basically attaching the output to the gate of the MOSFET. Not sure though what bridge you need. Is it for audio? Or for a power rectifier? Would like to have a non inverting driver, do you have any recommendation how to solve this, or best IC driver for arduino. Im actualy pondering the same question as Legolas. How can you design a non inverting circuit for controlling a non logic level mosfet where the 5v the arduino can provide is not enough to “open” the mosfet enough. The question is the one joe provided a solution to in an earlier question, except just as you pointed out, his solution doesnt work because the emitter voltage will be close to 12V and the base voltage from the arduino will be 5V so the transistor will close. Thanks, I learnt few things in my new journey. , Can I use this kind of MOSFET drivers for stepper motors via Aurdino UNO R3? I see. That was a MOSFET motordrive board you referred to. It doesnt look dedicated to a steppermotor though, more to drive a rgular DC motor. I try to make something like this but I’m not using arduino but a PIC18F4550. I should turn on a load (some LED lamps in paralel) with a Mosfet. In my schematic I use an output with a small resistor (150 Ohms) in series with the gate of the N Channel Mosfet (STP3NA) and my load is in drain (like the first schematic showed in this post, but I have no R1 resistor between gate and source, I only have a resistor like R1 in the second schematic). So, when I put the output high some of my LED lamps doesn’t turn on immediatly, it seems that has a flash before turn on. Is that normal? I think that is not normal. Who can tell me what should I improve i my schematic? Should I try to use a BC337 for exemple to turn on the Mosfet like the schematic 3 and in this case when I put my output high the Mosfet is off, so I should put it Low to turn on my load, is it? Dinah, that your lights do not light up immediately seems kinda odd, but could be a habit of the lamp you are using. What kind of lamp is it? I do not know the PIC18F4550 that well, but what is important is the Output voltage it has on its pins. The STP3NA I do not know very well and I couldnt quickly find a readable datasheet, but though it doesnt seem to be a Logic level FET, from what I could see, it should open enough around 3 volt already… but if you have a better datasheet, please check that. If it does open at 3 volt and your PIC supplies that, adding a transistor is not really necesary and if you do it doesnt need to be the BC337, can be a regular signal transistor too, like the 547. What i like you to do first is to detach the pic-circuit and just put 5 Volt on the entrance of yr FET circuit, via say that 150 ohm resistor, and see if then your lamp behaves the same. Hello – Great post ! I’m trying to build a H-bridge with mosfets (switching from ‘old’ NPNs and PNPs …). Could you please recommend a logic-level P-channel equivalent to the IRLZ44 or IRL540 ? Thank you. Olivier. Somehow Logic P channel mosfetsarent as plentiful. You could consider the FQP27P06. I presume you are aware of the designcriteria of an H-bridge and the chances of shorting your PSU if you dont do the switching correctly. Could I use the IRL540 (or IRL540N) in order to activate a on/off +24Vdc/10A solenoid valve? The circuit should be robust enough to support the load during a few minutes. Can i use this circuit with Arduino to drive 2 x 20W (1.6Amp each) LED Auxiliary lights on my motorcycle? I will use Arduino to dim the power acording to inputs from handlebar.. Please help. I´m am looking for a good reliable circuit to PWM the lights. Cheers! I would like to control my marine tank LED’s at 4amps 12v and have a IRF540 what circuit would be best suited to this type of application and part? However keep in mind that that driver inverts as well, so you have to invert your signals (HIGH-> off ; LOW-> ON). Really my advice would be to get a different FET, use the Logic level FET’s, such as the IRL540. I am not sure where you are based but the IRL540 costs abt 60 cts where I am. That just will make your circuit much easier and save you a transistor and resistor. Yes im using Arduino to control the circuit. I will try source a IRL540. So no R1 and T1 from your diagram link? Sorry no T2 and R1. Like the diagram at the top of the page here. I have IRL3713 and IRL540. I tried to switch an IR LED to control the air conditioner. I noticed that the range is very low. When I conneted a BJT (2N2222) it was ok, range was above 4 meters. I couldn’t understand the datasheet of IRL3713. The current of a MOSFET is Ids =K*(Vgs-Vt), so it should be constant for some Vds. But where can I find K in the datasheet? Also, from the graphs, Ids changes with Vds, is it because of the channel shortening effect? 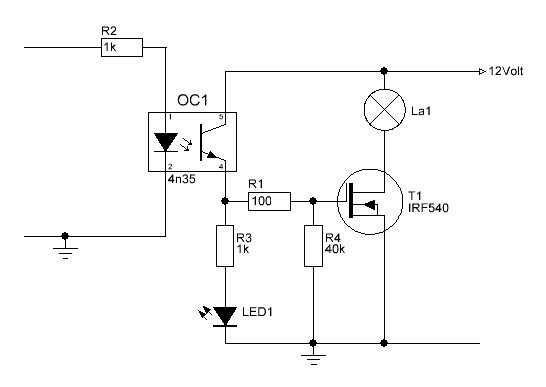 How can I find the current in the LED? IR LED’s usually have a high (80-100mA) current they can take. Do you have a type number for the IR LED? Then you can find the current in the datasheet? When you were using the 2n2222, what seriesresistor did you use. Was that the same as for the mosfet? Your formula Ids =K*(Vgs-Vt), is only valid under some circumstances depending on whether Vgs is bigger than Vt or not and wether Vds is close to the saturation or not. But in reality you dont need that formula as it mainly has to do with the range wherein the FET DrainSource acts as a pure resistor. The IRL540 is a logic level FET and putting 5 Volt on the gate should be enough to open it up, albeit that it has a drain source resistance of less than one ohm, though that depends a bit on the current and the temperature. I would suggest that you just use a 2n2222 or BC547 (or similar) and if you have a regular IR LED like SFH487 (880nM) or an LD274 (950 nm) drive them with 80-100mA. the 2n2222 has a collector current of max 800mA so that should not be a problem. For a BC547 it is a bit on the edge. 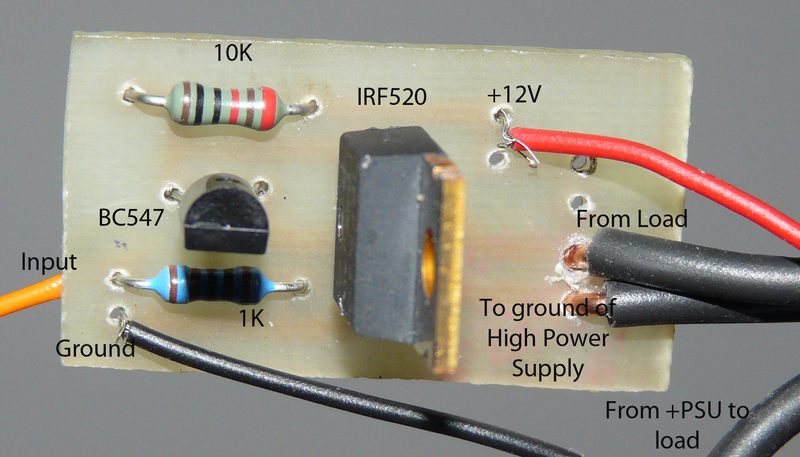 Generally, IRLED’s have a forward voltage of 1.4-1.5 Volt, so you need a seriesresistor. The Vce in saturation is about 0.3-0.4 Volts so you need to have a voltage drop of 5-1.7=3.3 Volts. For a 100mA current you then need a seriesresistor of 33 Ohm. Use a baseresistor of say 560 Ohm. That also explains why it is foolish (sorry) to use a powerfet to drive a 100mA IRLED. The IRL540 is aimed at currents up to 28 Ampere and therefore it aims at having a very low RDSon. 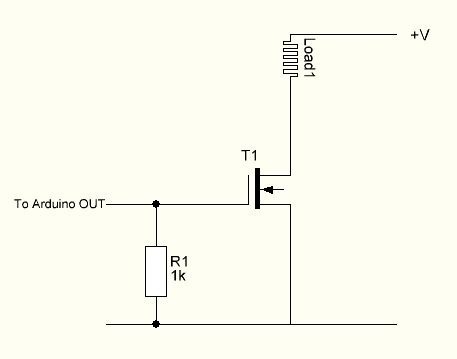 However, since your LED NEEDS a seriesresistor at 5 Volt, there is no point of choosing a FET with say a 0.077 Ogm resiatance, only to then add a bigger series resistor. you make a mistake. The irf450 doesnt need 20 Volt tu turn on. It already switches on at much lower voltages, albeit not completely, but the optimal voltage is around 10-12 Volt. The 20 Volt you probably saw in the datasheet, but that is the max voltage on the gate. I’m trying to switch a 3.7 volt 3A peak load (LoNet SIM800L breakout board) using an IRL540N with 5.2 volts on the gate but the circuit keeps shutting down. I’m using a 3.7 volts LiPo battery as a power supply. And a step up boost converter to supply the 5.2 volts on the gate. According to your post and the datasheet, the IRL540N should have no problem supplying the current at this voltage, right? Or am I overlooking something? When I power the SIM800L directly from the LiPo it runs fine. Please help me out. My hairs are starting to turn gray :-(. That indeed is odd and I start to wonder if it is the IRL540 that is shutting down or something else. Maybe you alreadymeasured it but just to make sure, when your problem aises, have you measured if there is still voltage on the gate or even voltage on your PSU? Try (just to test) without the converter, 3.7 Volt is not ideal but still should open the FET somewhat, and tell me what happened. Do you have the break out board in the drain or the source? HI, thank you for your fast reply and I’m glad you agree that this is odd behaviour! I seem to have missed your reply at first since I did not subscribe to your posts fast enough apparently :-(, but I’m here now. I have done like you said. It shows the same behaviour when I use 3.7 volts on the gate directly instead of using the boost converter. I am using this converter: https://www.kiwi-electronics.nl/2-5V-6V-naar-5V-USB-DC-DC-Boost-Converter. Perhaps it is a lose wire or something. The battery is ok and gives a steady 4 volts. I’m using a breadboard. Perhaps one of the wires is corrupt. I will try it again after soldering it instead of using a breadboard. Can I use PC817 Optocoupler instead of 4N35? And what if I wish to use 5V or 9V instead of 12V input, the R1 (100R), R3 (1K), R4 (40K ???) will stay the same values? Very good article, thanks for talking about a subject often overlooked by many. Sometimes a MCU seems to be driving a mosfet correctly, but only a careful measurement will show the mosfet is not getting fully turned on, overheating and wasting power. So, the bottom line is: always check the whole datasheet, specially the Vgs / Rds(on) curve, if the datasheet has one. 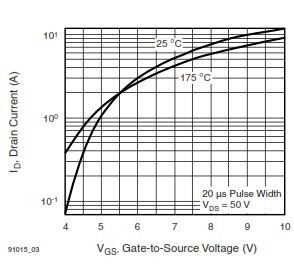 A mosfet may have great performance at low voltages, even if the datasheet initially rates it at Vgs = 10V. Thanks for your contribution. That 52 mOhms at 2.5Volt definitely is pretty good. better even than some TTL level MOSFETS. Thanks for pointing out that series. I was not aware of those. Checking the datasheet is always a good suggestion. Some people however have trouble reading a datasheet or do not know what to look for and in that case foing with TTL level FETs is a safe option. The AO6400 you refer to can handle almost 7 ampere. That is definitely enough for most applications. It is not expensive: If bought per 20 it is 26 eurocts a piece. Glad to be able to contribute! The only caveat using those AO parts, is their size: they are tiny, SOT-23 package, and that bring problems on soldering, and also on power dissipation! I already set a few of them on fire during testing / development, because they can’t stand much current in the linear zone. So, mistakes during development can be fatal. They indeed can stand almost 7A, but only when sufficiently on or off. For example, when used with a high frequency PWM and high amps, careful testing must be done, because high frequency means more time spent in the linear zone, and these parts can quickly get hot and burn, differently of TO-220 parts, that can also burn, but only after some minutes of overheating. Switching speed indeed is important. I emphasize that in my AC dimming with PWM article as in a MOSFET article I am still working on. I can imagine that a SOT23 indeed can only take a current the size of 7 amps if there hardly is any dissipation (read low RDSon). MOSFETs make excellent switches but bad resistors :-). Did you test something like AP90T03P-HF? Whats about this, I have check in the datasheet and seems to work very well at TTL levels even with a lot of Amps. The AP90T03P-HF is an interesting Mosfet. It is not a true logic level mosfet, it needs some 10 volts. However it has a very low Rdson. At 10 volt it is 4mohm and the fet can take 45 amp, but at 4.5 it is 6mOhm and can handle 30 amps. at 5 volt it is about 4.5 mOhm, so it will function well at TTL levels. Your post really helped me understand more about mosfet’s and there datasheets. But to be sure i had a question. I want to put around 10A of current trough a coil to make a partical accelerator. I had a IRF540 Mosfet but now i understand why it became very hot. My question was which MOSFET should i buy, could you give my some advice? I was thinking of the IRL540 and the IRF530 you mentioned earlier. if you use ttl logig the IRL540 is a good choice. The IRF530 not so much as it is not a logiclevel FET, though it does better than the IRF540. At 5 Volt GS it can however only take some 4.5 Amps, whereas the IRL540 I beleve can take 25 Amps (check the datasheet) with a rather low Rdson. In general you want a MOSFET that has a low Rdson and switches fast at the available triggervoltage (5volt with ttl) and ofcourse can take the voltage and current it will be exposed to. The input capacitance is best chosen as low as possible. Most MOSFETS will be between 600-1300pF. The capacitance is a factor in how fast you can switch the MOSFET. MOSFETs need tobe switched fast. They are good switches,but you dont want to use them as resistors. Thank you for this very good explanation. I am not used to Mosfets and was not aware of the differences between IRFxxx and IRLxxx Mosfets and was wondering why my Mosfets (IRF840) got terrible hot, even the current was only 2.4A while the Mosfet is specified for Ids max 8A. Using the transistor to drive the gate with higher voltage solved the problem. The simplest circuit is just a 12 V regulator but that is very inefficient. Hi, really interesting your information! !, you make easy the topic! thankss a lot!. I want to drive the CBT-140 WHITE LED. The datasheet mentioned a current between 21 Amperes -28 Amperes for driving led. I´m using a microcontoller to turn on and turn off the device. Is there any logic mosfet capable to drive 25 Amperes? or Is there any logic mosfet capable to support 150 W (power dissipation)? or do you recomend use a “classic” mosfet to drive this power? thank you!! also you may consider browsing through this guide. Hi, I’m having problem using IRF520. I just need to switch on and off small DC motor. Every time I tried with new IRF520, but any of them worked only for first time. and then the mosfet closes the circuit and never open again. It seems mosfet get burned every time. I just touched the gate pin to turn motor on. even if I release finger, the gate not closed. The transistor may burnt. I even used feedback protective diode with motor. what may be the cause for it? without exactly knowing your circuit, I would guess it is static electricity killing your MOSFET. Hi, awesome explanation, here I have a problem, I´m working with a RFD16N05LSM, it is a logic level mosfet so I should drive it by the 5v arduino output. I´m driving a 12v led strip, with 4 colors, but the different colors are connected to different wires, and then the ground is a common wire, so I have no other chance to use the mosfet between the 12v and the led strip. the deal is that when I turn on the mosfet with the high pulse of the arduino it just alow 5v out, but the drain is connected to 12v and I´m using a 10k resistor to ground at the gate. Do you have any idea why is the mosfet not working properly and letting the 12v works on the led strip? ok let me see if i understand you correctly: you have an NFET with the drain connected to 12 V and the source is connected to your ledstrip. And as i understand when you put 5 volt on the gate, the output (on the source i presume) is only 5Volt. That is not surprising. For this MOSFET to open you will probably need atleast some 3 volt GateSourcevoltage. As there is an LED in the source to ground (i presume), there is already a voltage drop, keeping the source above ground. Say that is 2 Volt. Then indeed the FET will open but it cannot go above 5Volt at the source, because then it will close again as the VGStsh is around 1-1.5Volt. 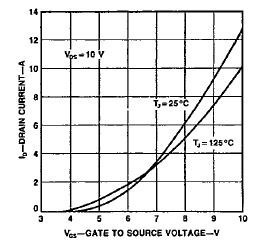 So if yr gate voltage is 5Volt, your source voltage will never be above that. thanks a lot for your answer, will reed on this. It’s actually much worse than you describe. Every curve you have used has in small print V(DS) = 50V (or similar HIGH voltage) Tw = 20uS. So the currents you are quoting are with a full supply voltage across the FET for a very short time. For FETs a much safer measure is R(ds_on) at a given gate voltage. Hello, would anyone know if NCEP01T18 can be driven by Arduino? This actually is used for heatedbed in 3D printers up to 180A. I would like to use it to switch car heated seat (12V, 8A). The NCEP01T18 has a Gate threshold voltage of 2.5-4.5 Volt. Though that seems like the FET is suitable for an Arduino, I do not think it is an optimal combination. I tried to find a Vgs vs RdsOn graph, but it definitely looks like this FET would appreciate a bit more Voltage on its gate. I bought it and it works with Arduino. It start switching on at around 3V and it seems to be quite wide open at 4,5V. I am actually using it with octocoupler connected to 12V. I am getting almost 7V at the gate so no issues. Sadly I didnt find a good graph to relate maxpower or RDSon to the 7 Volt gatevoltage, but I guess if it is working it is working. Keep an eye on the temperature though when you start using it with 8 amps. I require to use Arduino along with driver and power MOSFET for getting an output of around 1 to 1.5 k V.basically an SMPS for applying on very low loads.I am planning to use 2SK3748 Power MOSFET. My dilemma is am new to this field so is there any other better power MOSFET for high voltage switching application and driver for the same.The only conditions are it should have high switching speed so low rds on and high break down voltage. just to let you know that NCEP01T18 is holding great. At 8A it is not even breaking a sweat. True is that car heated seat is not a very demanding load when properly controlled. Setting a temperature to a comfortable level arduino switches the mosfet on for 10-20sec followed by a 50sec off time. Silly late to the game 6 years after the fact, but as a bunch of IRLZ44’s arrived today, I put them to the test: Rds 38mOhm with a Vgs of 3.3 volt. Very nice! If you happen to only have non Logic level MOSFETs laying around, i.e . IRFZ44, and you want to switch somewhat higher voltages (i.e. your 12 volt LED strips) a good design is to use a MOSFET driver, such as a TLP250. It contains an opto-isolator and does all the gate driving. Also easier if you need to do high side switching. No such thing as too late though as Fet’ s are still around and when I wrote the original post I think it only dealt with 5Volt. Asyou know I have been hesitating between the IRLZ44 and the FQP30N60L, the latter being often advised on the raspberry fora, but it seems your results are quite good. it seems the handouts has switched the terminology for ‘saturation’ and ‘linear/triode’ region, hence explains your confusion. i am amazed how notes from education institutes got them wrong. So I ordered IRL540 FET’s to replace the IRF520 FET on this board.